Accurately deteremines representative portion of residue in emulsified asphalts. Determine the water content in petroleum products, tars, emulsified asphalts and other bituminous materials. 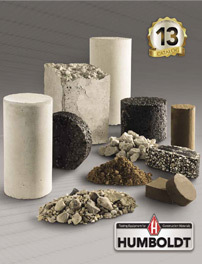 Used to determine solubility of asphalt cement materials. Particle charge meter identifies cationic emulsified asphalt, meets ASTM D244; AASHTO T59. The manufacturing of these materials are required to meet standards set by ASTM and AASHTO to ensure that they fall within established limits and characteristics. Bituminous materials used in pavement require a much higher ductility than those used for less demanding applications, such as waterproofing or crack filling. The Dean Stark moisture test apparatus is used to determine the water content in petroleum products, tars, emulsified asphalts and other bituminous materials by the distillation method. The distillation process allows the water in the test sample to be isolated and collected in the receiver of the trap. Dean Stark moisture test apparatus are available in both electric and gas configurations. Gas distillation traps can also be used to determine levels of volatile distillates. Humboldt provides a variety of apparatus with which to perform distillation assessment for asphalt testing. If you have questions or need help selecting equipment, please call us at 1.800.544.7220 or use our Quick Response form.